It's almost the 15th of the month! At the HSCFFS Facebook group, it's time to clean house. We delete the comments from the ISO photo threads twice per month. Once on the 1st, and once on the 15th. If we let them accumulate, they would very quickly become overwhelming and donors would hesitate to visit them. Although we have to make sure the ISO threads adequately represent current needs, and that our current, ACTIVE members in good standing have a chance to get their needs met, there IS hope. Don't worry! Read on. We will usually keep comments up from about the 13th/14th of the month, and don't delete them. If you go into your comment, and simply edit it - within a couple of days or so of the volunteer moderator's clean-up (normally around the 15th of the month), then your post will be updated with a more current date - we will see that it has been recently updated, and will not delete it! What's even better is that your post will then be pushed to the top of the list, and our generous donors will see that you are still in need. Don't give up! I know for a fact that there are donors who search the ISO posts FIRST, before posting to the wall, and attempt to send you a PM to offer you their donation. IN FACT - WHEN USED DONATIONS ARE GIVEN TO ME, I NEVER ANNOUNCE IT - INSTEAD, I MYSELF WILL CONTACT YOU VIA THE ISO ALBUM! 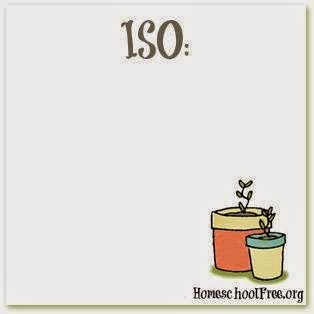 Used curriculum that is donated to the organization is NOT STORED ON A SHELF but immediately offered through PM to those on the ISO wall. Be sure to check your "other folder." Donors will usually attempt to tag you on the wall, but sometimes donors don't know to do that, so it's best to check that folder every once in a while.